[SatNews] XCOR Aerospace® today announced its selection of Matrix Composites, Inc. of Rockledge, Florida as the manufacturer and supplier of the XCOR® Lynx® Mark I spacecraft composite chine panels. Artistic rendition of the Lynx Mark 1 spacecraft and the composite chine panels. 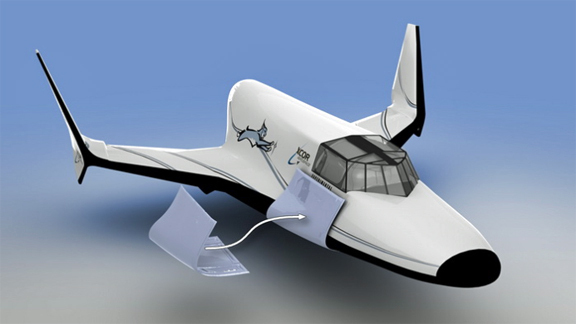 Image is courtesy of XCOR Aerospace®. "The chines allow the Lynx fuselage to have a continuous aero surface from the tip to the back of the strakes," said XCOR Chief Technology Officer, Jeff Greason. "Once the strakes are bonded and the nose is installed, the chines will be added to unify the space between the two, with some custom fitting at each end." "As Lynx comes together at Hangar 61 in Mojave, we are expanding our presence in Florida, the future home of our Lynx manufacturing facilities," said XCOR Chief Executive Officer, Jay Gibson. XCOR Aerospace is expanding its Florida presence through a partnership with Space Florida. The company plans to locate its Lynx Mark II manufacturing facilities at Kennedy Space Center. Dave Nesbitt, Matrix Composites' President, said, "To be part of their mission of research, science, private spaceflight, and micro satellite launch is very exciting work, highlighting our capabilities with high performance composites."